During the first two weeks of the course, more than 100 applicants, mostly selected in the surrounding communities of different conservation areas, participated in intensive training to test their mental and physical endurance abilities. Of these applicants, only forty have demonstrated sufficient skills to proceed with the training. 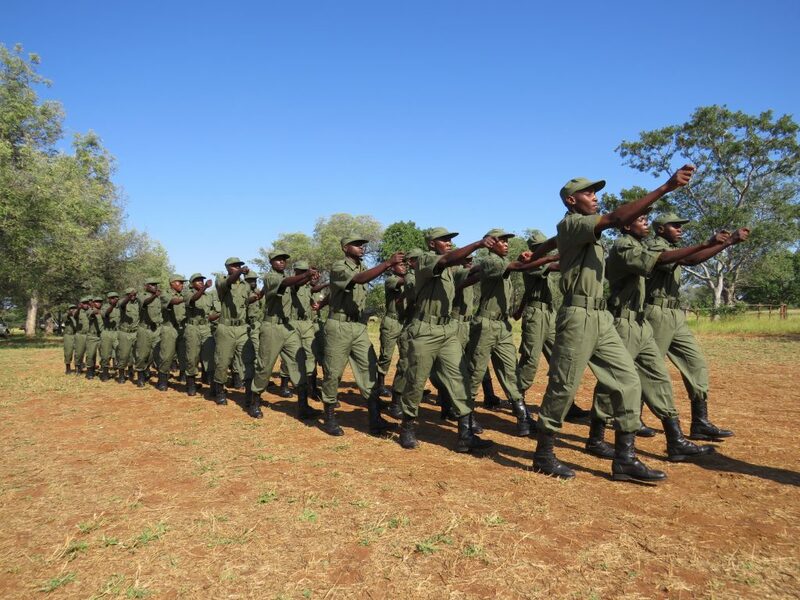 The training had a theoretical and a practical component, both dealing with issues related to anti-poaching operations, such as patrolling, road-blocks, gate controls and arrest procedures. At the time, senior inspectors from the Limpopo National Park, as well as several local institutions, contributed to the training of graduates, especially with regard to sector legislation. Of the thirty-nine elite inspectors who have completed the course, twenty-nine will be assigned to Limpopo National Park, which continues receiving pressure from poachers of key species such as elephants and lions. The park has also witnessed increase of cases of poisoning and traps, methods used to decimate various species, which include large numbers of vultures and small carnivores important for the balance of ecosystems. The new members of the class will strengthen enforcement capacity in the so-called Intensive Protection Zone, which borders the Kruger National Park, a measure aimed at protecting areas with greater poaching density and potential for tourism development. The rangers will operate from a new mobile base of field operations, supported by a helicopter, which will greatly increase their mobility. Still in Limpopo National Park, five other rangers were appointed to offer support to the Carnivore Protection Program. Their specific activities include patrolling and monitoring of carnivores in areas known as carnivorous areas. The measure aims to gain a better understanding of the movement and habits of animals, reduce the potential of man – wildlife conflicts and eliminate threats of poaching. The remaining five rangers will strengthen enforcement measures and combat illegal poaching and logging in Banhine National Park. This batch of graduates results from a project initiated by National Administration of Conservation Areas in partnership with Peace Parks Foundation to improve the inspection capacity in Greater Limpopo and Lubombo Transfrontier Conservation Areas. Last year, the project trained and employed twenty-six rangers in Zinave National Park and five in Banhine National Park, and in the near future plans to increase more thirty rangers to the team of Maputo Special Reserve.